Where in the world is Leon Panetta — on Fridays? You are at:Home»Uncategorized»Where in the world is Leon Panetta — on Fridays? Call it Fridays with Leon. Defense Secretary Leon Panetta works in Washington. His home is in California. That’s a lot of flyover country in between, and Panetta has stopped off at Air Force bases the past two weeks to shake hands, answer questions and pose for photos with the troops. He stopped by Peterson Air Force Base, Colo., on July 29. His “stay was brief and the group small,” according to a news release. Next Friday, the Doomsday Plane landed at Offutt Air Force Base, Neb. 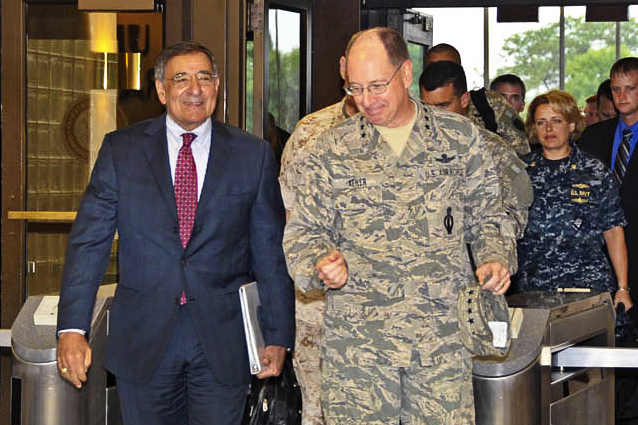 Panetta stopped by U.S. Strategic Command headquarters and met with the honchos there. So what will this weekend bring? We don’t know yet, but the smart money is on a military installation somewhere in the flight path between D.C. and central California.